This visualization shows 483 patterns from 5 different designers, organized into 8 categories. Each dot in the graph below represents one pattern; hover over it to see which one it is! The shaded region shows which patterns appear in the image randomizer below the graph. Use the filters at the left to see specific designers and categories. To change the selection of patterns, click the Randomize! button. We hope you find a new pattern to make! Most of these patterns are available for purchase. How does that affect the number of projects? What's this? It's a fun way to explore cool knitting patterns from great designers. 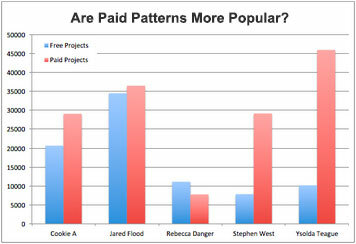 Explore patterns from popular designers. Hover over the dots to get information on patterns. Clicking on popups takes you to Ravelry.com. Images of patterns and their links are here. No filters? Then we show you random selections. Click 'Randomize!' to mix it up. You know what to do now. Explore!